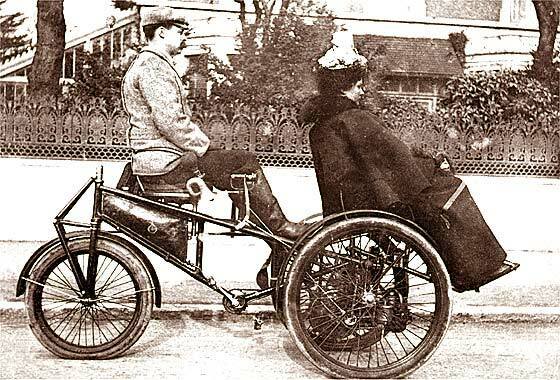 Quite unique photo received from Mike Brewster (UK) of his relatives on in a motorised tricycle c1900-10. Driver may be Frederick Richard Simms ? -- Single steered rear wheel and two forward driven wheels, engine under passenger. A short lived cca 1900 Simms's 'Motor Wheel' made by The Motor Carriage Supply Co. Considered a bit unstable and made for only one year, designed by Frederick Richard Simms who was one of the founders of the British Motor Industry, and of Brighton Run. Couple of lovely photos received from Jane Robinson (UK) who is researching family history and found this picture dated about 1907/8. Husband's family owned the house and car. Any ideas what make it is? -- The Registration looks like LC 2142 which is a London CC issue of mid 1905. The car is an expensive luxury vehicle with a racing pedigree. This is a cca 1905 Napier 28HP Tourer made in Acton London in a factory with 1200 men. Became very important in aero engines for WW1 and WW2. 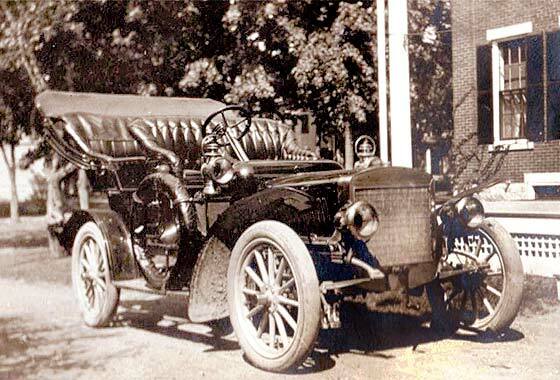 Another puzzling photo posted on the AACA website, this by Eddistone, asking if anyone can identify this old family car? Tradition says it is a Crestmobile, but he doubts it. -- Various makes put forward but I think it is a lot more obscure. I am relatively sure this is a cca 1906 St Louis 32'36 Touring. Initially St Louis Motor Carriage Co, St Louis, then SLM Car Co, Peoria Ill. 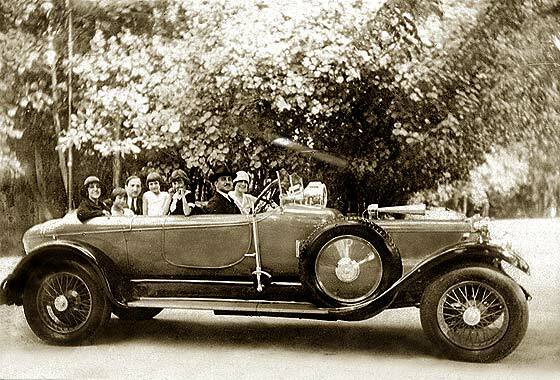 Luxury well built car with a 4 cylinder engine of '30-40 Actual HP'. Went into receivership 1907. Original SLMCC became Dorris. Another set of lovely photographs from our regular contributor Cicos Florin in Constanta by the Black Sea (Romania) who is interested in old cars of Romania. Unknown race in Romania. Do we know what the cars are? -- Another where a lot of head scratching went on and is not a definite identification. The resolution of the photos is too poor to permit accurate identification. No ideas on the back facing cars but feel from the rad that the one facing could be a cca 1906 Clement Bayard 35HP. Another lovely photograph from our regular contributor Cicos Florin in Constanta by the Black Sea (Romania) who is interested in old cars of Romania. 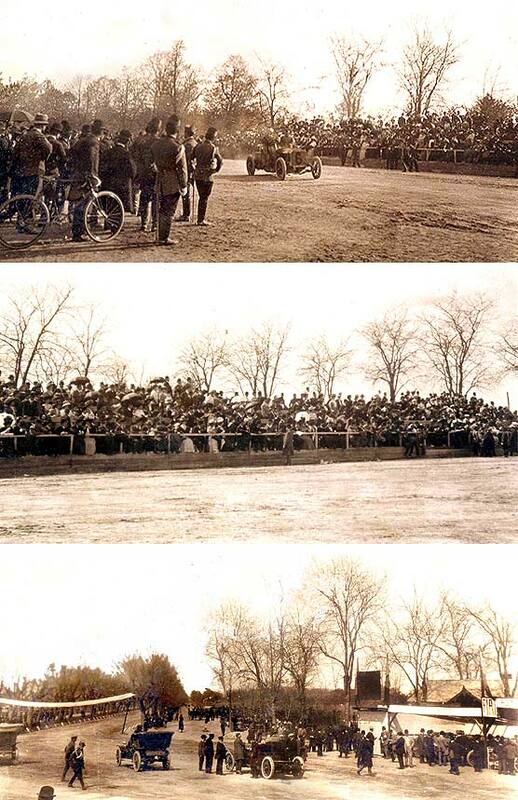 Race in Romania 1908 Baneasa-Bucuresti. What are the cars? -- The one on the right was relatively easy from the scalloped bonnet being a cca 1907 Lorraine Deitrich involving Ettore Bugatti. The other car was a little more difficult having a quite large radiator and a deeply bowed front axle, being cca1907 Gobron-Brillie, opposed pistons! Cinema screen grab taken from an British short film " London's Free Shows" made in 1924, part of 'Wonderful London' DVD 2012, where cars are being investigated by IMCDB. 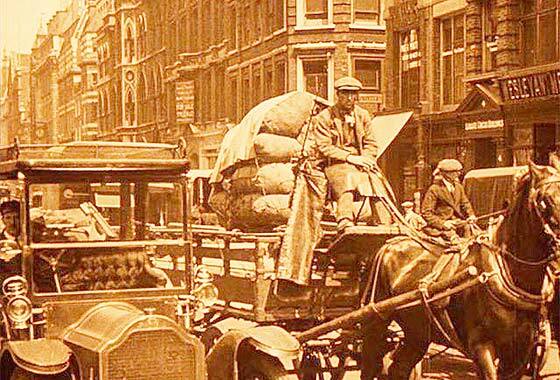 Film is full of street scenes showing how rare vehicles were amongst horses and carts. -- This is from a French manufacturer who established company and factory in the UK in 1907 at Selly Oak, Birmingham, making one model of car. This is a cca 1910 Lorraine Dietrich 20HP Landaulette. British company folded 1911. 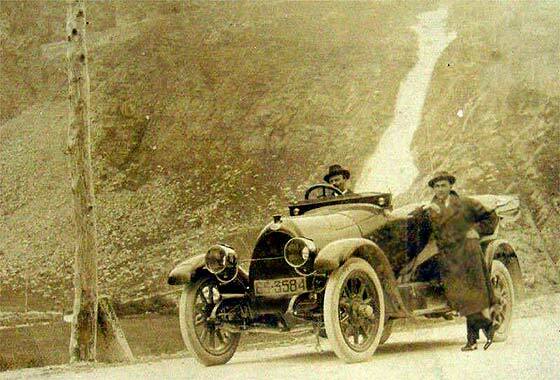 Photograph posted on the PreWarCar website by Tjitske van Lievenoogen asking if anybody can identify the mystery car. The man in the picture is his grandfather, died 1934. 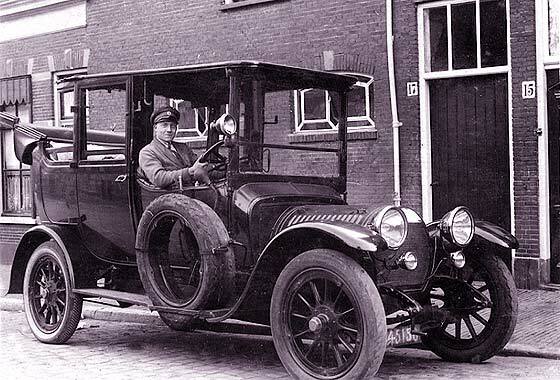 The licence number is from 1925, but the car is older, 1907 or therabouts and location is The Hague. -- We feel it had been miss-identified as a Dutch cca 1907 Spyker but we are relatively sure this car is French and it is a cca 1911 Hotchkiss 18'22 Landaulette. Hotchkiss bonnets were corrugated along full length. Surfing through the internet in attempting to identify old vehicles we often come across photographs or old Postcards, including those on Rootschat and those for sale on Ebay, of interesting ancient machinery which has not yet been identified, so we have a go ! -- Truck which seems to be car sized with a lorry back added. The faint badge seems to be an eagle with a cross shield, bonnet has three louvres and photo has 1917 on it. This would seem to be a cca 1911 Bianchi 20'30 conversion. Another photograph posted on the AACA website by Leif Holmberg (Sweden) asking if anybody can identify the mystery car he is helping a museum with. Military orientated car; Swedish air force emblem. Stoewer? -- Stoewer had rounded top radiators in period. We don't think this is German but French. Looks very much like a cca 1914 De Dion Bouton Tourer. Gas lamps, no filler cap on scuttle, pre WW1 and used in the war. Looks like one of the smaller fours; EX DX EK or EL. Surfing through the internet in attempting to identify old vehicles we often come across photographs or old Postcards, including those on Rootschat and those for sale on Ebay, of very interesting ancient machinery which has not yet been identified, so we have a go ! 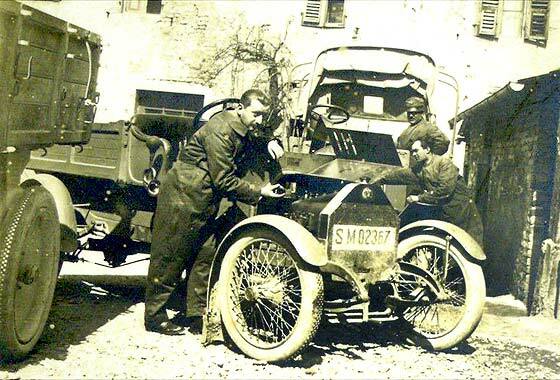 -- This seems to be a cca 1914 FIAT 52B Torpedo which looks to be fitted with electric sidelights on windscreen support but has older gas headlamps. Electrics came about 1914. It also has the later pear shaped radiator. Surfing through the internet in attempting to identify old vehicles we often come across photographs or old Postcards, including those on Rootschat and those for sale on Ebay, of very interesting ancient machinery which has not yet been identified, so we have a go ! -- Interesting photo of a truck having nearly nose dived into the abyss. Lots of soldiers so probably part of a WW1 army convoy. 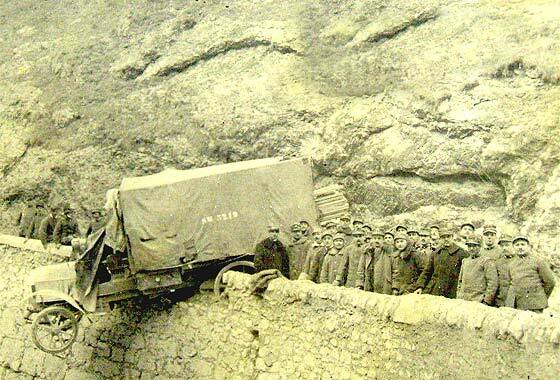 Chain drive and three louvres suggest cca1915 FIAT 18BL Lorry. Over 20,000 made. Another photograph posted on the AACA website by Leif Holmberg (Sweden) asking if anybody can identify the mystery car he is helping a museum with. Fire-engine based on a beautiful car! -- Indeed a very nice machine. Chassis is American made in Cleveland, Ohio by Scottish immigrant who had made one of USA's first cars in 1897, Alexander Winton. 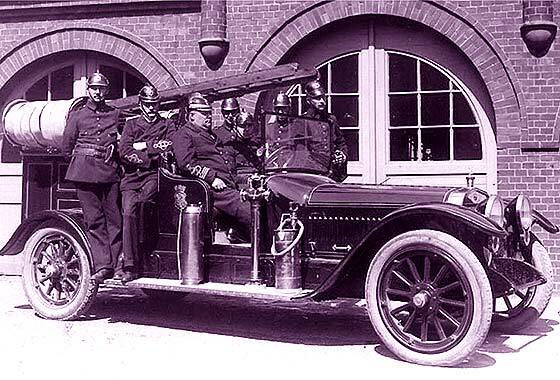 This is a cca 1916 Winton Six Model 33 with a fire-engine body. Blurry photo received from Akshay Singh Maksudpur (India) showing The Maharaja of Tikari, Gaya, Bihar (centre in blazer) with son Amar Singh (on tiger) returning from a tiger shoot with tiger and wild boar. 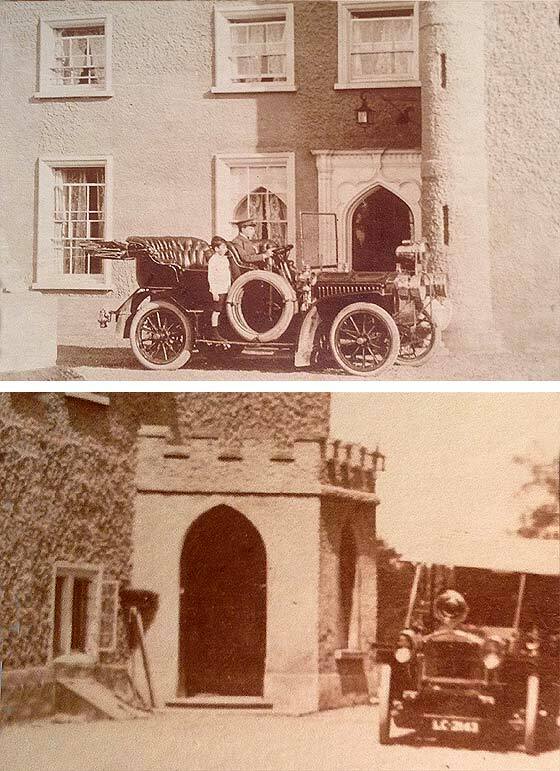 The Maharaja was an automobile racer in exotic machinery in UK and India. -- This is an American utility vehicle, a cca 1918 Ford Model TT lorry chassis, local body. Ford Model TT 1 ton truck was made 1918 to 1927 only in chassis form. 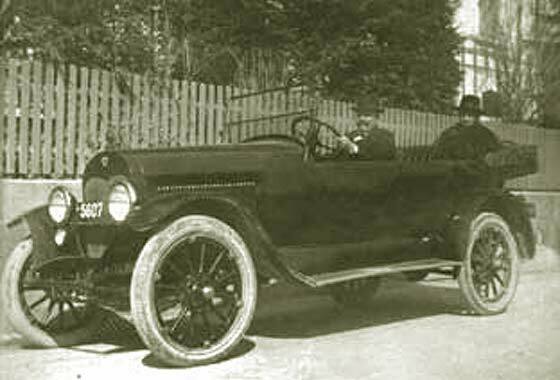 After 1924 also available with factory body. Photograph posted on the PreWarCar website by Marino Ferrari asking if anybody can identify the mystery car with an interesting body shown in the picture? -- The chassis and body are from two different periods. The bulbous scuttle is indicative of pre/post WW1 period, no cars built for duration. The curvature and length of the bonnet suggests this is a cca 1919 Daimler 45 chassis which would have had a period body, but replaced later by a delightful mid 20s body, wheels, mudguards & lights. Another photograph posted on the AACA website by Leif Holmberg (Sweden) asking if anybody can identify the mystery car he is helping a museum with. Probably a a European car, possibly Horch? -- Confirmed not a Scania Vabis. Horch had rounded oval radiators in period. This has flat edges and badge is raised and central. 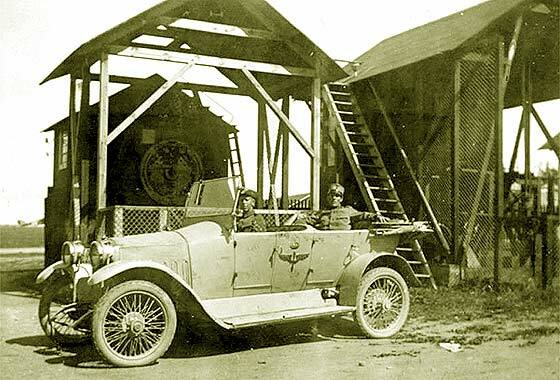 We think this is a German car carried over and made just after WW1, before they changed to spitzkuhler rads. We think this is a cca 1918’19 Presto P8 8’25 Tourer. A little blurry photo received from Melissa Peakman (UK) saying she has this photograph of her Grandfather, believe taken in the early 1920s, when he was employed as a Chauffeur in Morayshire, Scotland. Can we identify the make of vehicle please? -- Reg is Elgin CC. Looks American. Although the badge is quite visible it is blurry and had damage which we have repaired. 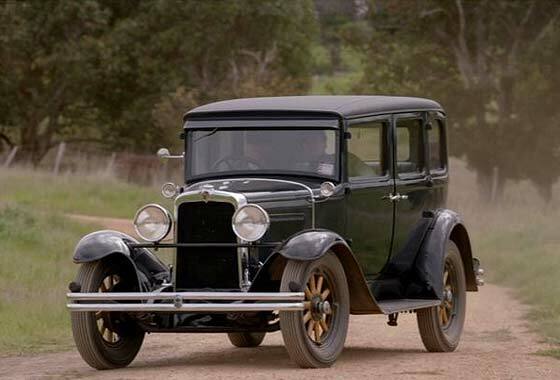 Our Mark Dawber suggested a Maxwell from Detroit, and indeed it is a cca 1920 Maxwell Model 25 33hp Touring. Surfing through the internet in attempting to identify old vehicles we often come across photographs which are not identified or misidentified. This item refers to albums delivered to Wright State University by Thomas Glessner Weaver (USA) about Noel Elwood Weaver. 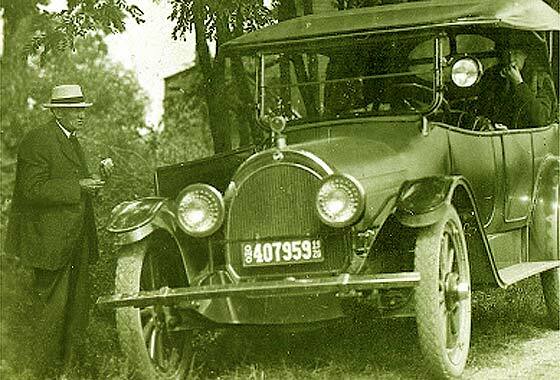 -- Photo is tagged as a Buick but the rounded radiator says it is a cca 1920 Oldsmobile 45B Touring. Oldsmobile had rounded rads cca 1917 to cca 1925. The triangular shaped bumper bar came in cca 1920. Photograph posted on the PreWarCar website of grandfathers car. 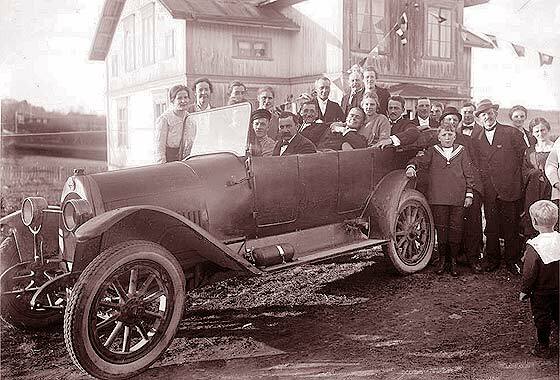 The photo is from 1921 when the car was bought new. Note the radiator line, the left hand drive and the special rims. Can anyone help? -- This photo remained unidentified for some time despite the rather obvious heart shaped radiator. The rims indicated that the car was American. This is a cca 1921 Crow-Elkhart L65 Tourer, made in Elkhart, Indiana when the company was going down. They also made the Morriss London car. Another Photo received from Simon Powell (Caymen Islands). 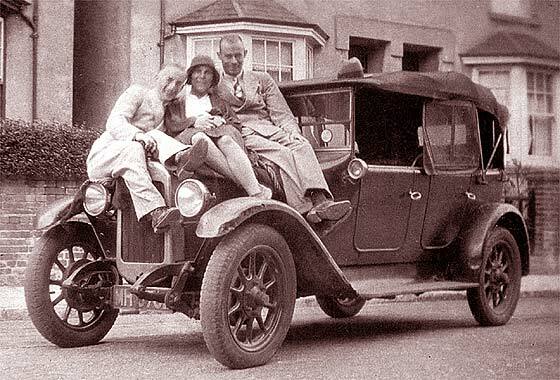 Photo is of his my grandmother and grandfather (and a friend), sitting on a car! This would probably be between 1928 and 1932. -- Registration MH is Middlesex and the numbers suggest early 1925. By the time of the photo was taken the car had received a few dents. 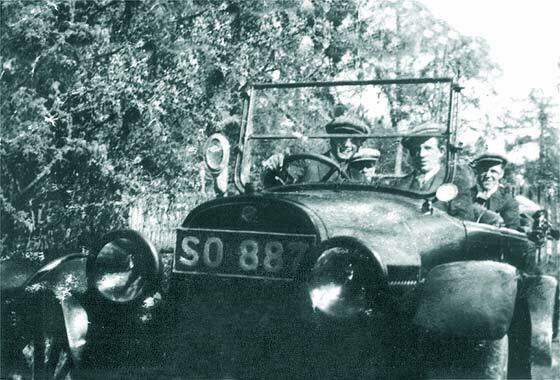 This is a cca 1925 Austin 12'4 Clifton Tourer, of which 88,000 were made. 12.8 HP, 1661cc, 20BHP, 45mpg touring, 27mpg, and cost £550. Known as Heavy Twelve. Lovely photo received from Ruddy Sommereyns (Belgium) who found the negative at a local fleamarket and would like to know what brand of car it shows? -- Very grand big car but unfortunately the radiator and bonnet are blurred so do not show the scallops in both. Fortunately it is possible to see the exposed half of the rear spring which confirms Belgian origin of the car. 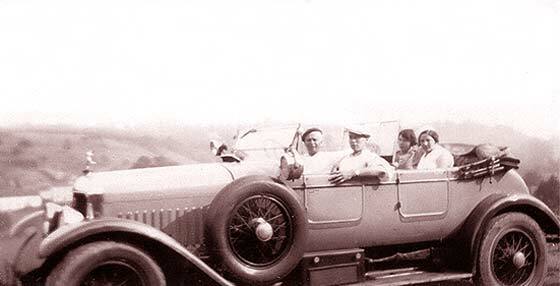 The car is a cca 1925 Minerva 30HP Tourer but we have not been able to identify precise coachbuilder, if not by works. 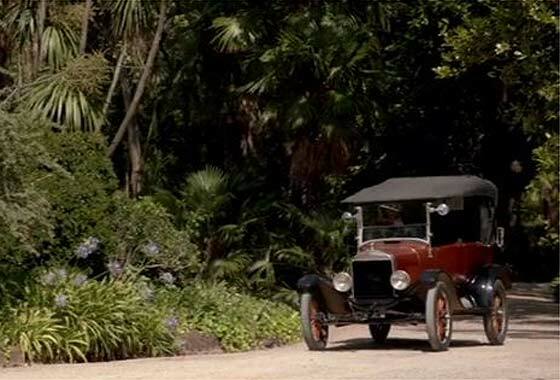 Cinema screen grab taken from an Australian television drama series 'Miss Fisher's Murder Mysteries' first broadcast in 2012, where cars are being investigated by IMCDB. Film is about a glamorous private detective in 1920s Melbourne. -- Transverse spring so confirming Ford Model T, and rounded bonnet with six louvers which signify the car was made at the end of 1925. Multilouvre bonnets started soon after. 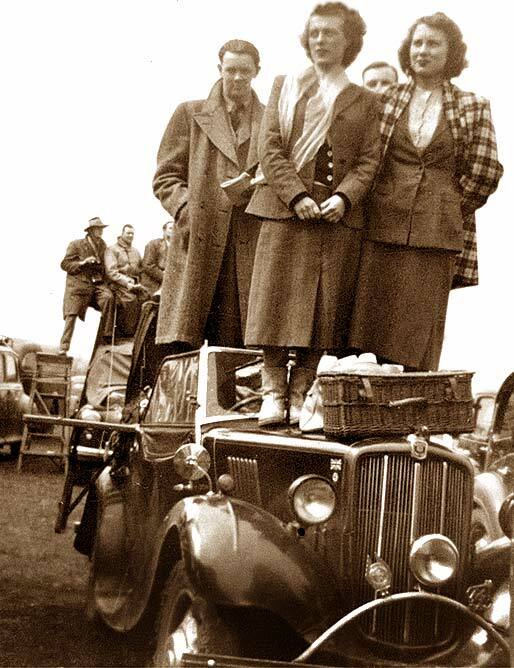 Nickle plated radiator was available as an optional extra from 1926 on Tourers. Another Photo received from Simon Powell (Caymen Islands) who lived in Cheadle Hulme, Manchester. 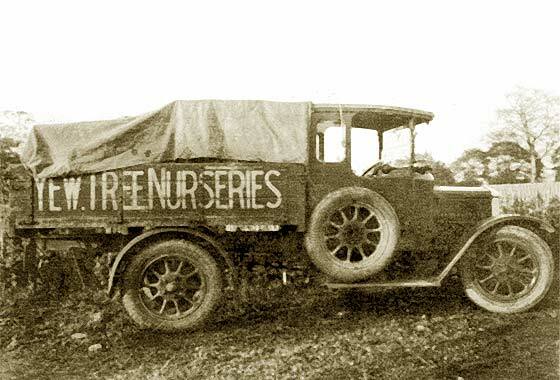 This was the delivery truck for his Grandfather's Nursery, in Northenden, Cheshire. 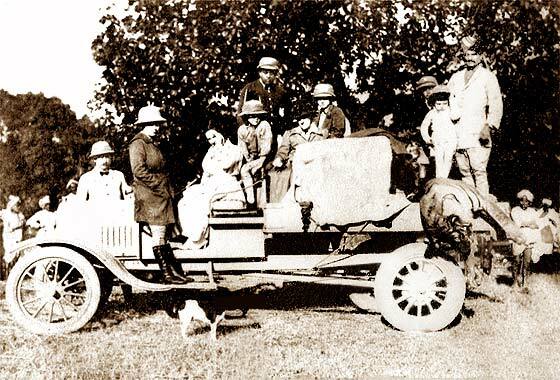 -- Very grainy photo and a bit indistinct at the front of the vehicle but from the bonnet and the cab, and especially the wheels, we are relatively sure this is a cca 1926 Morris Commercial T Type 1-Ton Drop-side Truck. Morris bought EG Wrigley in 1924 to built light commercials. Became Morris Motors 1936. Cinema screen grab taken from an Australian television drama series 'Miss Fisher's Murder Mysteries' first broadcast in 2012, where cars are being investigated by IMCDB. Film is about a glamorous private detective in 1920s Melbourne. -- This is an American cca 1929 Nash 420 Standard Six Sedan. The headlamp does not have the slight peak on the hedalamp of the 'Advanced', nor the double row of louvres of the 'Special'. The badge is new snakeskin design, and has twin bar bumper. 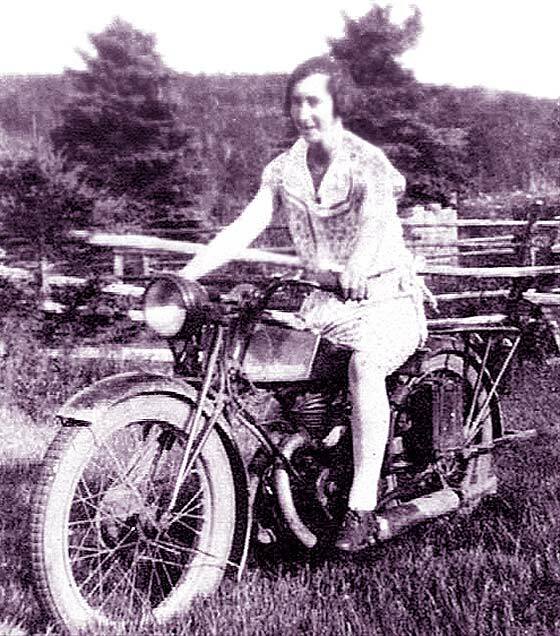 Photograph posted on the Rootschat website by Bonnie Jean (UK) asking if anybody can identify and date the motorcycle from the family archives. Grandfather lived in Nova Scotia, Canda. -- Our motorcycle experts agree that this is a cca 1929 Francis Barnett 1.75bhp Super Sports No.9, with a type BZ Villiers 172cc two stroke single engine. Technically interesting, were good performers on 1927 International Six Days Trophy and took class race record at Brooklands at 61.92 mph. Another Photo received from Simon Powell (Caymen Islands). Photo is of his relatives at Silverstone watching the racing. They would open the roof, put a plank across the body, and two of them could stand on the plank and watch the racing! -- Plus two on the scuttle or bring your own ladder, as on car behind !! Fortunately quite easy to identify because the badge is plainly visible and the grille has chrome vertical separators made for one year so can only be a cca 1938 Morris 8 Series II Tourer.